The Women’s Osito 2 Jacket by The North Face has been one of the brand’s most popular products, after, of course, the Denali Jacket for which the brand is widely recognized. The Osito 2 is a lightweight jacket in high-pile raschel fleece, which gives the item its signature plush “furry” look. It features a structured waist for a feminine fit, and stretch in the cuffs and drawcord hem. It also has two zippered pockets to secure your stuff or just keep your hands warm! Part of the Osito’s popularity is the wide range of colors that it is offered in, from standard neutrals like black and white, to pink and mint pastels, to bright fuschia and dark eggplant. The jacket also bears the well-known The North Face logo on the right breast, embroidered in a color which matches or complements that of the coat. There’s an Osito color to match every style, which is why just about everyone has one! And if you’re considering giving a jacket as a gift this year, the Osito 2 is a great choice: with its numerous color options, you’re sure to find one to match your recipient’s taste. The Osito 2 Jacket is both fashionable and functional, unlike some of its more technical counterparts from The North Face. It is designed to be an everyday use spring and fall jacket for mild to cold temperatures. With Michigan weather as unpredictable as it is, this is a great lightweight option to have on hand for those in-between temperatures when it’s too cold to be without a jacket, but too warm to break out your parka. Its soft, fuzzy feel is cozy and warm, but it doesn’t shear the wind or repel moisture. Luckily, the Osito 2 is easy to layer under a shell, like The North Face Venture and Resolve jackets–and of course it color coordinates. You can also layer under the Osito 2. While some of the women’s TNF jackets seem to run small, the Osito 2 is true to size and has a relaxed fit that makes it a natural choice for bundling up in layers. The Osito 2 Jacket pairs really well with other winter accessories from The North Face, including the Denali Thermal Beanie, made of the same silky-soft raschel fleece material as the Osito, in a variety of colors to match. The Denali Thermal Etip gloves also feature the fuzzy fleece, with a synthetic grippy palm that lets you hold onto your gear or your coffee cup with ease and touchscreen-compatible fleece on all five fingers, so you can stay warm answering calls on the run or capturing that perfect winter moment in a picture. 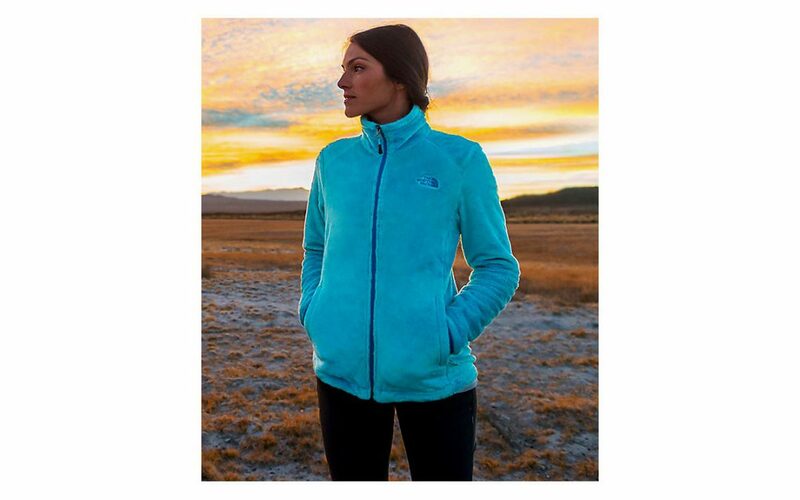 Check out the rest of Earth’s Edge Women’s styles from The North Face including the Osito 2!